A rundown of the companies with the most million-case brands in the Millionaires' Club 2016. Diageo and United Spirits, which together have 37 million-case brands, hit the headlines in 2015. The ‘will he, won’t he’ was finally settled in February when business tycoon Vijay Mallya agreed to resign as chairman of USL. The exit deal included a $40m payout and the stipulation that he would not compete with Diageo/US in the global beverages market, except in Britain for the next five years. Now Mallya is out, the company will hope it can focus on its mammoth portfolio and regroup after half its million case brands experienced decline last year. There was also change for Brown-Forman. As of next year, its major player status will go down a notch. Unless it invests in another brand in the next 12 months, Brown-Forman will drop from six to five million-case brands, following the sale of its Southern Comfort and Tuaca liqueur brands for $543.5m earlier this year. Gruppo-Campari also got in on the action, selling its ‘non-core’ spirits business earlier this year and launching a ‘friendly takeover’ of Grand Marnier owner Société des Produits Marnier Lapostolle in March this year. This and the likes of Diageo offloading most of its wine business to Treasury Wine Estates and Beam Suntory selling its Spanish brandy and sherry business to Emperador, keep the major players’ league an interesting one. 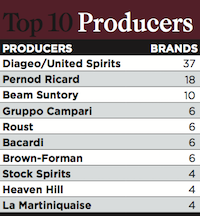 in the domestic market continues to hamper hopes of Stock Spirits going any other way but down this list.